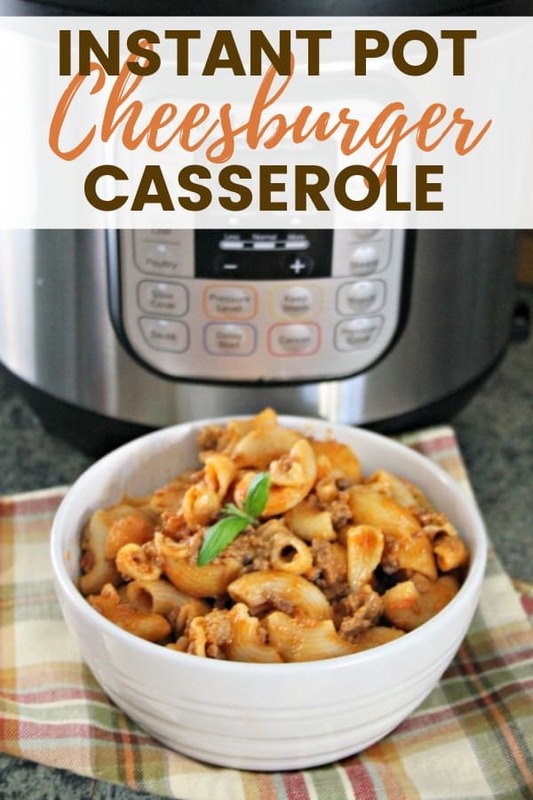 If your family likes Hamburger Helper, they will love this Instant Pot cheesy hamburger casserole recipe — and you will love how easy it is to make! It is truly unreal how many awesome meals you can make in your Instant Pot. People often think of making meats and vegetables, but you can make full meals right in your Instant Pot – like this Cheesy Hamburger Casserole. If you would prefer a skillet and oven version of the recipe, I have one of those as well: Cheeseburger Casserole. 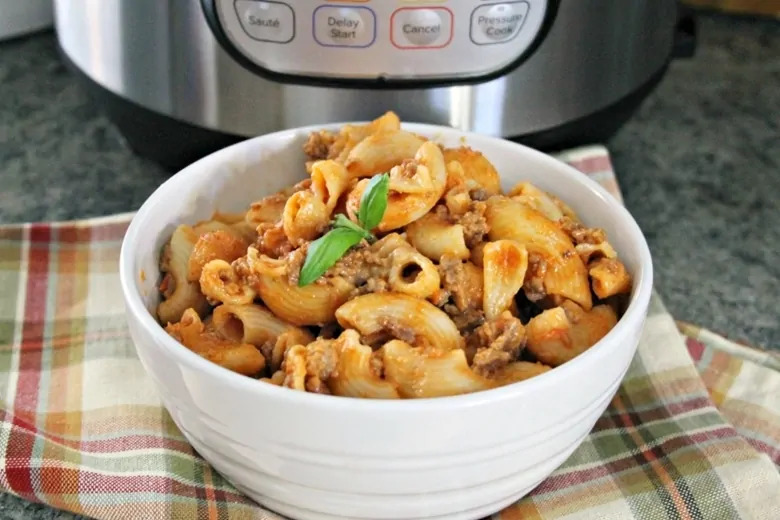 If your family loves Hamburger Helper, they are going to love this Instant Pot cheeseburger pasta recipe. Made with ground beef, macaroni, and two types of cheese, it is sure to be a family favorite. 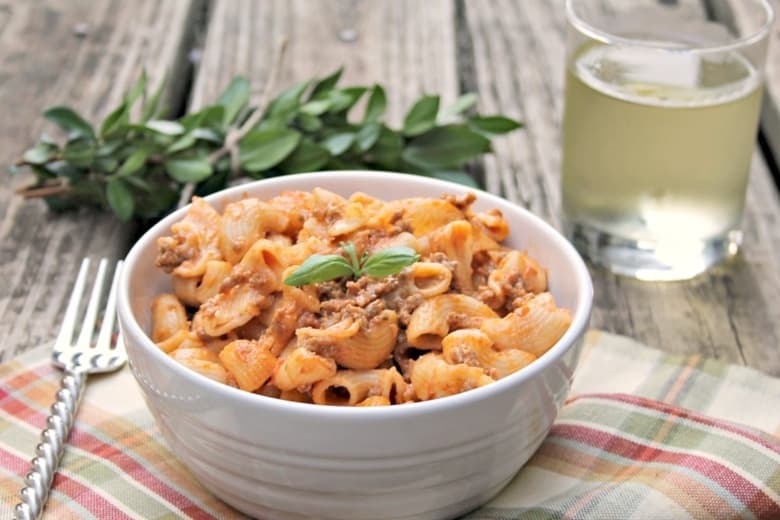 Best of all, this recipe is just as quick and easy to prepare at Hamburger Helper! So if you want to make more from-scratch meals for your family, but don’t want to spend a lot of time in the kitchen, it’s time to dust off that Instant Pot. The first step to preparing this tasty ground beef Instant Pot recipe is to gather all the necessary ingredients. 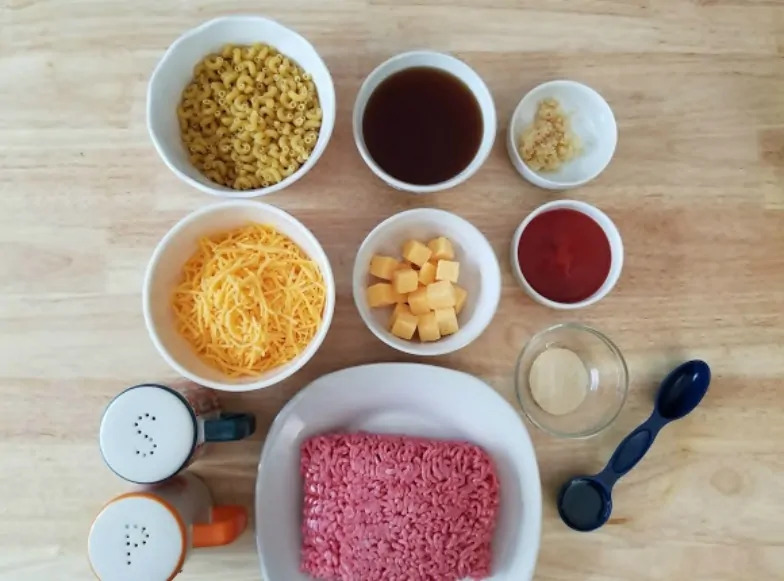 For this cheesy hamburger casserole recipe you will need: lean ground beef, pasta, tomato puree, beef broth, olive oil, garlic, onion powder, and your choice of cheese. We used a mix of cheddar and american cheeses, but you can use whicher cheese you prefer. Next time I might try this recipe with colby jack – yum! 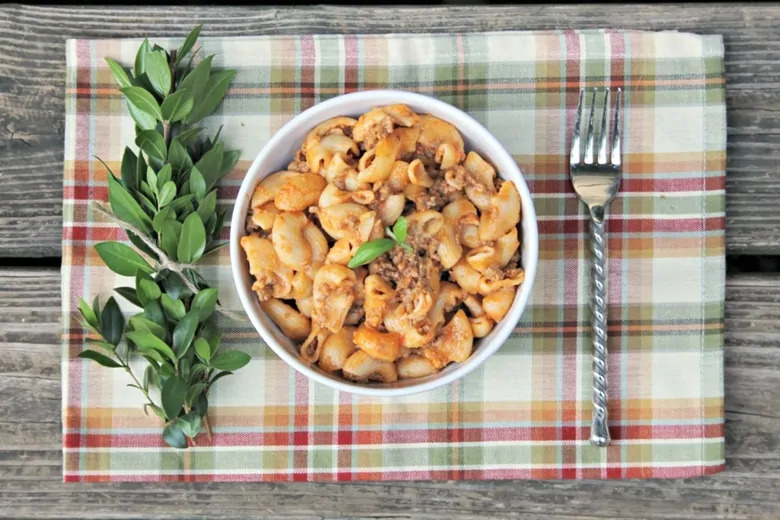 Any small macaroni noodle will work for this recipe — elbows, cavatappi, shells, etc. So feel free to use whatever you have handy. 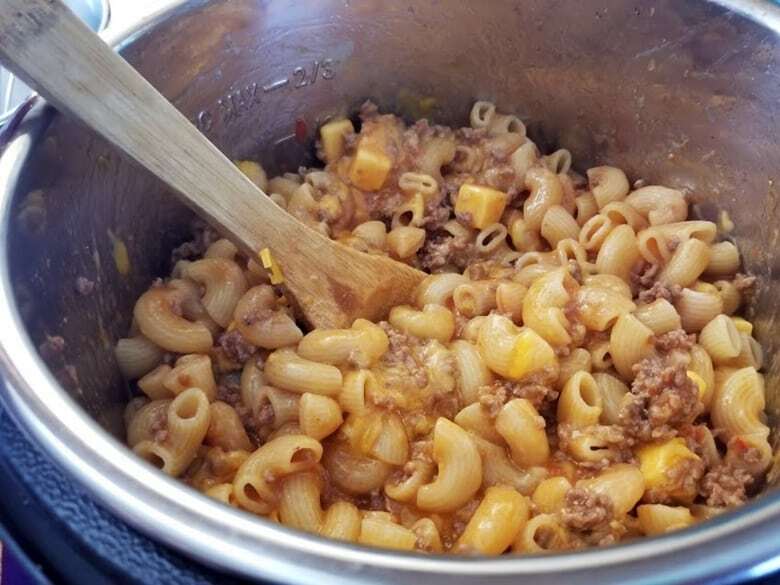 As I mentioned, cooking this cheeseburger macaroni casserole is quick and easy. First, set your Instant Pot to the sauté/browning setting. 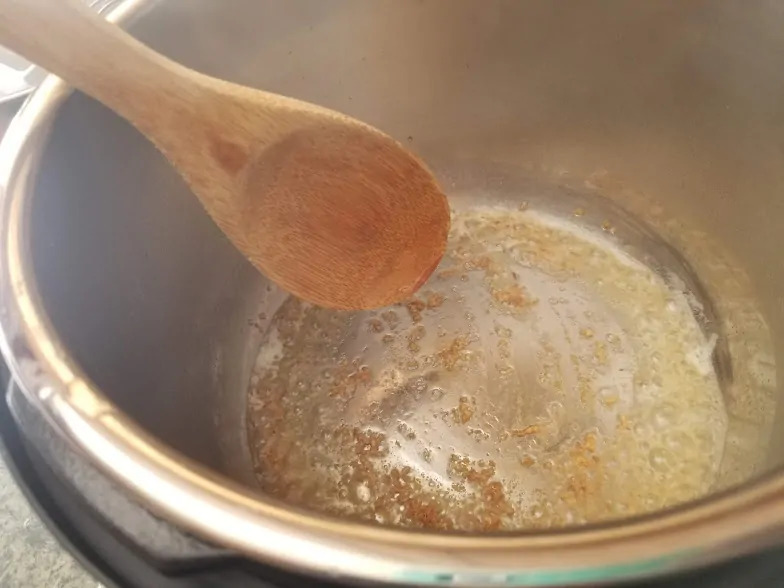 Then, add oil. Once the oil sizzles and garlic and cook for 1 minute. Next, add ground beef and cook until it has browned throughout and no pink in showing. 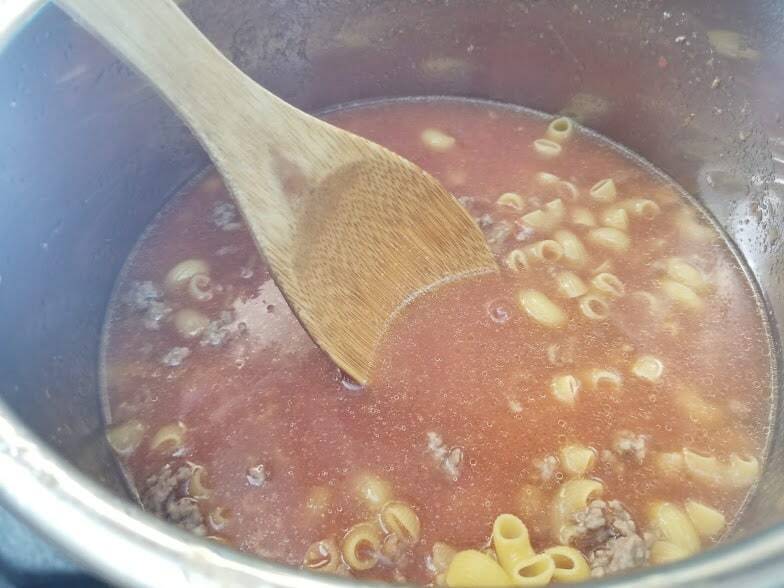 Then, add tomato puree, beef broth, pasta, and seasonings, stirring to mix well. 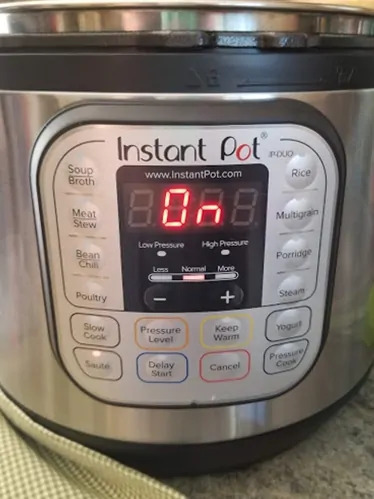 Set the Instant Pot to high pressure and cook for 5 minutes. Then allow pressure to return to normal. Add cheese and stir gently to mix and allow cheese to melt. Serve immediately and enjoy. But a friendly word of warning — this will go FAST. Like lightning fast! 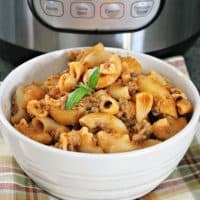 If your family loves Hamburger Helper, they will love this Instant Pot cheesy hamburger casserole -- and you will love how quick and easy it is to make! Set Instant Pot to sauté. Add oil and allow to sizzle. Add garlic and cook 1 minute, stirring occasionally. Add salt and pepper, onion powder, tomato puree, beef broth, and pasta. Stir gently to combine. Set to high pressure and cook for 5 minutes. Allow pressure to return to normal. Add cheese and stir gently to allow cheese to melt. Serve immediately. We used a mix of cheddar & American cheeses, but feel free to use the cheese of your preference. When should I add diced onion and diced green pepper? When you say “allow pressure to return to normal,” are you referring to a natural release?